I recently Googled "chicken recipe" and came up with 2,050,000 results (in .12 seconds no less). The sheer volume of different preparations for chicken is nothing short of amazing and really goes to show how versatile an ingredient chicken is. If you're not sure what you want when you go to find a chicken dish, it can be quite overwhelming because practically everything sounds delicious. When I make chicken it's usually something quick, either a stir-fry, chicken piccata, or an amazingly simple and flavorful saute dish with a pan sauce of balsamic vinegar, honey, and fresh chopped basil (which will definitely appear on this blog at some point). It's easy to become lost in all the possible flavors and ingredients that can go into a dish, but the funny thing about chicken is that it really doesn't need anything else to help it along, it can stand on its own quite well. One of the best ways to cook a chicken is roasting a whole bird in your oven. If you really enjoy chicken, the flavors brought about by roasting are incomparable. Just carve it up and serve it with any type of potato you like, any veggie side you like, and you have a wonderful meal. Aside from being delicious, whole birds are cheaper per pound, which makes organic chicken more affordable (you are buying organic chicken right?). While there are many approaches to roasting a chicken, you can get away with simply seasoning the skin with salt and pepper and putting in the oven at 350 degrees until the thigh registers about 170 degrees. I've had a good roast chicken that was half frozen at the start of cooking (due to an oversight by 4 guys hanging out in a cabin for a few days) and cooked sitting in its own grease on the tiny metal tray from a toaster oven. Seriously, it was amazingly succulent (and completely devoured in about 30 minutes). Of course, you need to take a little more care if you want to ensure crispy skin and white meat that is not desert-dry. For things like this, I always turn first to Cook's Illustrated. Since I have a subscription to their original magazine, they've been sending me free copies of their new magazine, Cook's Country. I would describe the recipes it features as traditional, regional, home-cooked comfort food. The last issue I received had a roast chicken recipe that promised crispy skin and delicious potatoes in one roasting pan. Sounded good to me. Like most things from the people at Cook's Illustrated, this roast chicken is a bit more hands on than traditional throw-it-in the-oven-and-forget-about-it-until-it-is-done type recipes, but as usual, the extra steps are well worth it. Start by lining your roasting pan with tin foil then placing the pan on the middle rack of an oven set to 475 degrees. You rinse the chicken and pat it dry, use a skewer or fork to poke small holes all over the skin, then rub it with a mixture of corn starch and salt. As the chicken cooks, the fat comes through the holes and mixes with the corn starch creating a nice, crisp coating on the skin. Spray your roasting rack with oil and place the chicken on the rack, wing-side down (on its side). Carefully remove the hot roasting pan from the oven and place the rack with the chicken in the pan. Roast for 15 minutes, then remove the roasting pan from the oven, flip the chicken onto its other wing and roast for 15 minutes. In the meantime, scrub your potatoes, halve them, and coat them with oil and a bit of salt. After the chicken has roasted for 30 minutes, you take the pan out of the oven again, remove the rack with the chicken and place it on a baking sheet. Gather up the foil with all the drippings and remove it from the roasting pan. 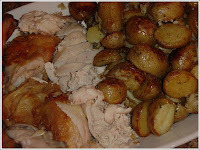 Arrange all the potatoes cut side down, and place the rack with the chicken back in the pan over the potatoes. Flip the bird so it is breast side up and put it back in the oven to roast for about 20 more minutes, until a thermometer in the thigh reads 170 degrees. Please don't trust the pop-up timer, get yourself a digital, instant-read thermometer (this way you'll stop wondering when things are done and actually know). When the chicken is done, pour any juices that have collected in the cavity into the pan with the potatoes, and rest the chicken standing up on either the insert from an angel food cake pan or an empty soda/beer can. The chicken should rest 10 to 15 minutes before carving. Stir the potatoes up a bit and put them back in the oven to finish cooking. Basically you cook them until they're as brown as you like them. For me this took about 20 minutes (and I cranked the oven up to 525 for the last 5 minutes to really get them brown and crispy). Now all that's left is to carve and serve. I invited my parents over for dinner, made some some Brussels sprouts as a second side, and served the whole thing on one dish, family style. 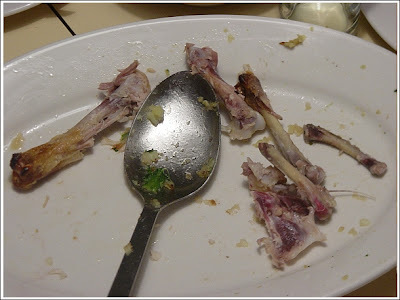 The chicken was incredibly good, and perfectly cooked, with moist, flavorful white meat (this is the true test, because the dark meat is pretty much always moist and delicious). The skin was not as crisp as I had hoped, but I think this was largely due to my manhandling it rather awkwardly as I flipped it around. It tasted good though. The potatoes were great as well. Not adding them until the middle of cooking and after the chicken grease was discarded ensured that they were neither mushy nor greasy, but slightly crisp and tender. My 1 year old daughter thought the chicken was just about the best thing she's ever eaten, and continuously chose more chicken over bread even (which is a small miracle, believe me). As my dad would say, this chicken did not die in vain. Sounds terrific! I like a labor-intensive recipe as much as a simple one and look forward to trying this. Thanks! For a less labor intensive recipe, do a search for Thomas Keller's Mon Poulet Roti. I've made it five times since finding it online. I'll be following your adventures, I'm a school administrator and my wife teaches math. We are familiar with the struggles of home cooking with limited time. Wow, this was fantastic. Followed it a T and everything came out perfect. I thought I'd already created the best roasted chicken ever but this tops my best-- and is my new go-to. thank you! Good for those with Celiac disease that miss crispy chicken.